March is now over and we’ve featured four more excellent video trailers on Indies Unlimited this month. Take a moment, check them out, and then let us know which one you liked best by voting for Trailer of the Month. Take a look and pick your favorite. No cash. No prizes. It’s all for the glory! Well, and for the fun, of course! Just click on the links below to see the corresponding video trailer, then come on back here and cast your vote. One vote per person, please. . Which was your favorite video during March 2015? February is now over and we’ve featured four more excellent video trailers on Indies Unlimited this month. Take a moment, check them out, and then let us know which one you liked best by voting for Trailer of the Month. Take a look and pick your favorite. No cash. No prizes. It’s all for the glory! Well, and for the fun, of course! Just click on the links below to see the corresponding video trailer, then come on back here and cast your vote. One vote per person, please. . Which video trailer run in February 2015 is your favorite? 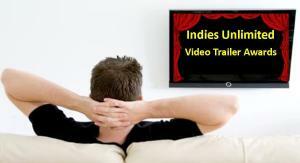 Five weeks in January means five excellent video trailers featured on Indies Unlimited this month. Take a moment, check them out, and then let us know which one you liked best by voting for Trailer of the Month. Take a look and pick your favorite. No cash. No prizes. It’s all for the glory! Well, and for the fun, of course! Just click on the links below to see the corresponding video trailer. One vote per person, please. . Which video trailer from January 2015 is your favorite? The big holiday rush is over. So grab some leftovers, put your feet up, and check out the great book trailer videos we ran during the past month on Indies Unlimited – and maybe you’ll find a book or two to read on your new Kindle! Now, you have the opportunity to let us know which one you liked best by voting for Trailer of the Month. Take a look and pick your favorite. No cash. No prizes. It’s all for the glory! Check ’em out for yourself by clicking the links! One vote per person, please. . Which video trailer for December 2014 should win the honors?